I’m popular, attractive, and self-confident! High number of friends == attractive? Score! And what happens at 800? 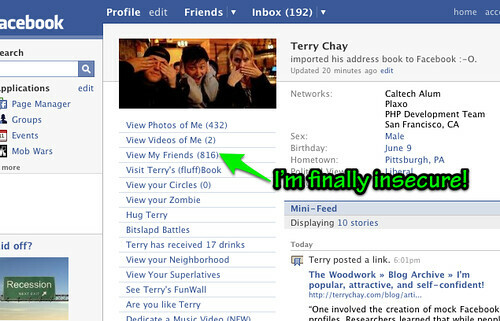 Does the Facebook CS team come and beat you with an ugly stick? I thought you’re supposed to troll their tagged pictures to decide about this one. And now that they’ve ajaxified the photos page, it’s oh so easy to do! I am sad that Halle doesn’t use the blog I made her at http://www.halletecco.com. I may have at least 400 people on my Facebook profile that I have never met, but I feel somewhat connected to them because I can keep in touch with them online. What is insecure? I really don’t know what that means. Terry, you can keep going, you have 135 more friends until you’re beat with the insecurity stick. Me, on the other hand… I need to remove some friends.